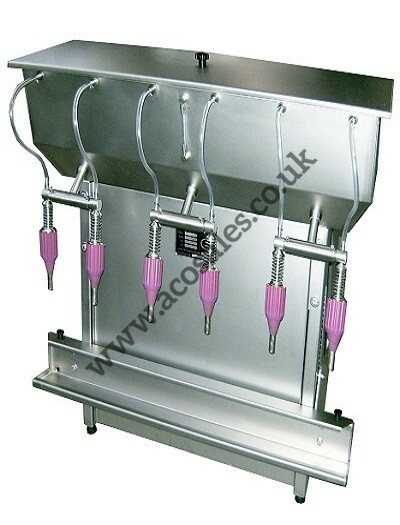 The ACO Gravity Filling Machines are ideal for filling free flowing non-hazardous products like wines, spirits and fruit juices in to glass or plastic bottles. The frame is made in stainless steel together with stainless steel worktop and product tank. The 14mm diameter nozzles are easy to dismantle and clean. The empty containers are placed directly on to the filling nozzle and lowered back down on to the bottle bar. They are then filled automatically and to a preset level then can be placed onto a table top ready for capping. This easy operation ensures quick and constant production. Bottle size change is an easy operation – raising or lowering of the bottle loading platform by hand.